My latest make, I'm loving this border print and can't resist a square neckline! 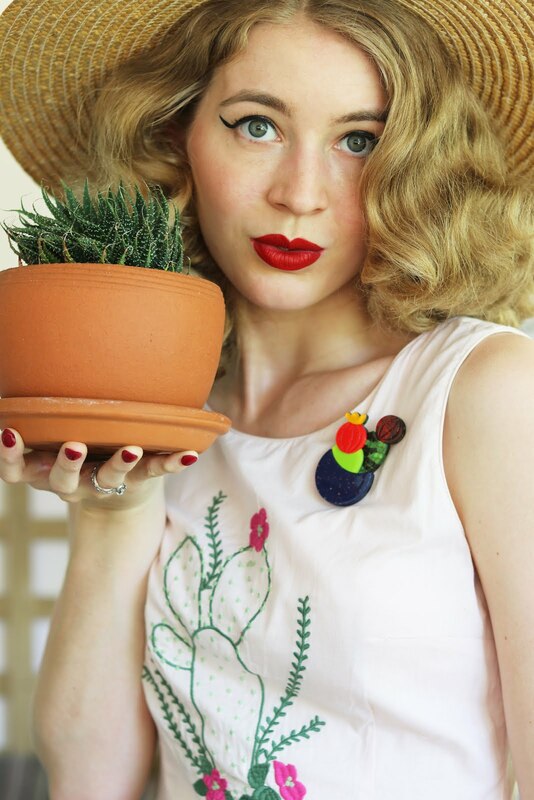 After seeing Gertie's dress a while back I had been planning to make myself one! Luckily I have access to the Gertie fabric range here in Australia at our Spotlight stores, this is also dangerous though. I have accumulated a lot of Gertie fabric but have been holding out to use it because it's my "good fabric" so of course I must test patterns until I am certain that I will be happy with the end result and then I allow myself to use the good stuff. Although I have spent a small fortune on my good fabric I have managed to buy a lot of it on sale and on clearance but that doesn't mean that I'll waste it on any old project. I used a mash up of patterns and made a change to the bodice of the pattern which wasn't that major, I just ignored the split in the bodice so I could have a straight square neckline. Square necklines are probably my most favourite neckline, I also think they are quite flattering on me but I really just love them. I am probably just going to end up making a lot of square neckline dresses for myself over time haha! This dress was a pretty simple make, the most time consuming was gathering that skirt and the cotton sateen fabric is quite thick so it was the part that required the most patience! Good thing I don't mind gathering, most of my makes involve it. I'm still not sure if I'm 100% happy with my bodice fabric print placement but nonetheless I still love this dress. I lined the bodice with a light black fabric which looks nice on the inside (sorry I haven't taken photos of the inside)! 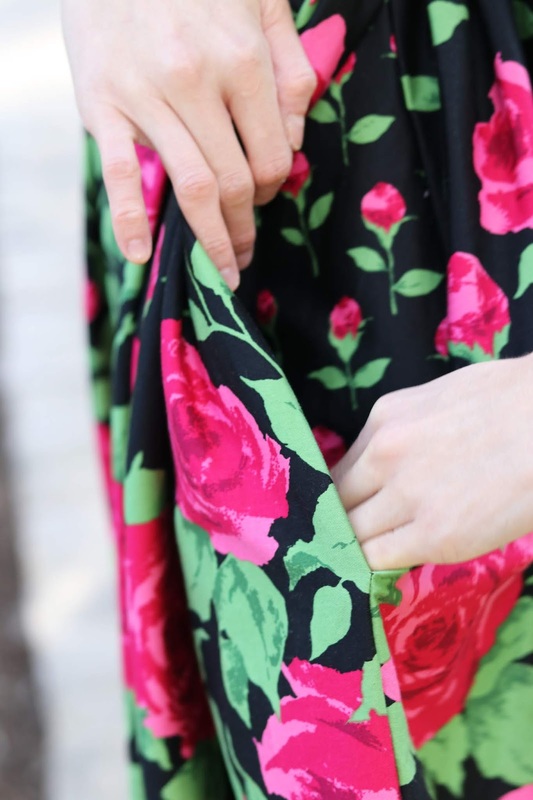 One little that I really love is that I made the pockets with tiny roses from this fabric which looks so sweet when I pop something in them (a little design detail that I'll only notice when I wear it but sometimes they are the best details). 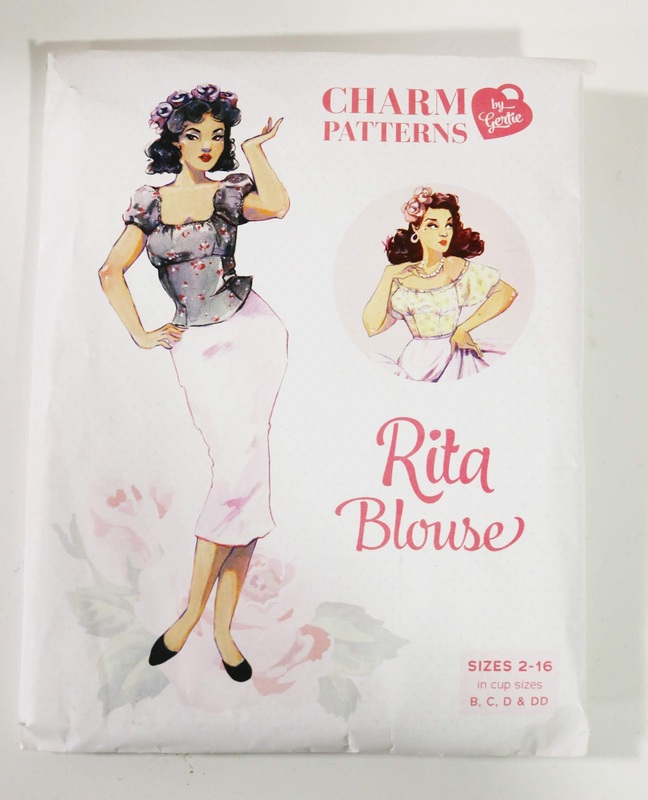 This is really great fabric as it has different size roses so you can be as creative as you want with it, I also bought it in white ha! I also ordered myself some garment tags to attach inside my garments when I finish them, oh my does that feel satisfying when I complete a project! I'm throwing it back to my January trip in Melbourne and the day I wore this awesome jumpsuit (and when it was much warmer)! A jumpsuit with a cropped length is always a winner for me, perfect for summer and practical too. I was so excited to wear this jumpsuit when mum and I went to Melbourne for a fun filled trip and now I'm excited to wear it again after looking at these photos... But not until summer! 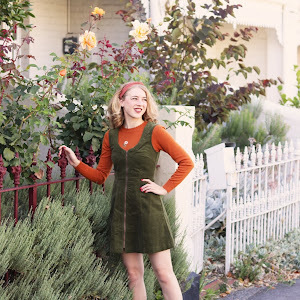 I was drawn to the gorgeous orange colour, the eyelet fabric and of course the fun cut-out. The store I bought it from doesn't stock it anymore, perhaps it will return at one stage but I'm glad that I snagged one for myself. I also wore this hat with most outfits on the trip and as you probably know it's one I wear constantly with outfits so it's now my trusty boater hat that's for sure. I have another outfit or two that I didn't share from this trip so I might blog them at some stage. It has been raining most days I have for taking blog pics and I've been extra busy but this has been a good opportunity to dig up some outfit photos that I have not shared yet! More sewing patterns have been added to my collection lately and more plans for a bigger me made project have been planned. I'm really happy with how much sewing I have done this year and I'm glad that I have made time for myself to do it because I really love it! 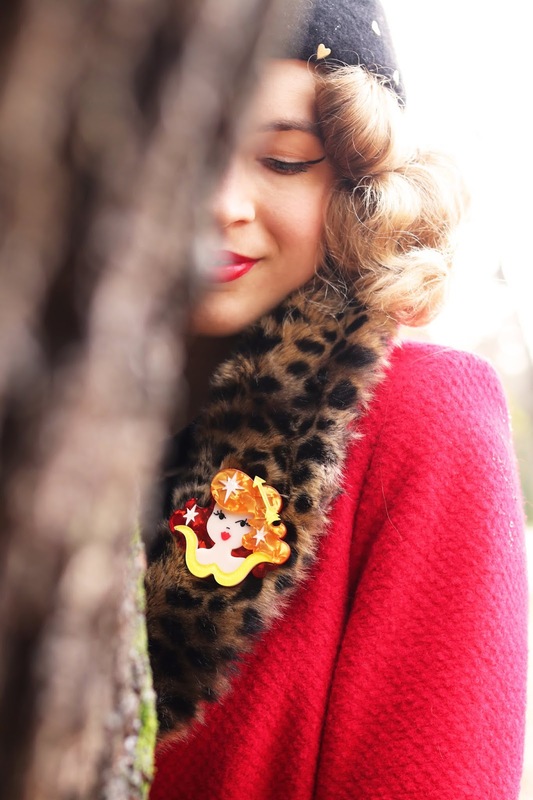 A gorgeous collection by Erstwilder featuring absolutely stunning zodiac brooches. 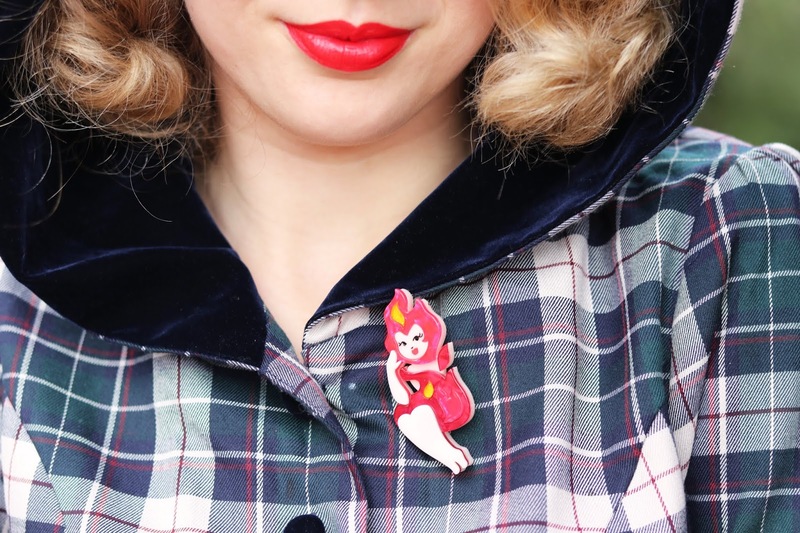 Check out my beautiful Sagittarius and Fire Sign brooch! It has been another rainy week which has been inconvenient for blog photos and hanging my washing out on the line. Whenever we driven to the park for the last couple of photos sets it has been absolutely pouring but for some strange reason the rain clears for 15-30 minutes so we can get photos and then as soon as I get home and close my door the rain continues to pour down, I feel pretty lucky when that happens! 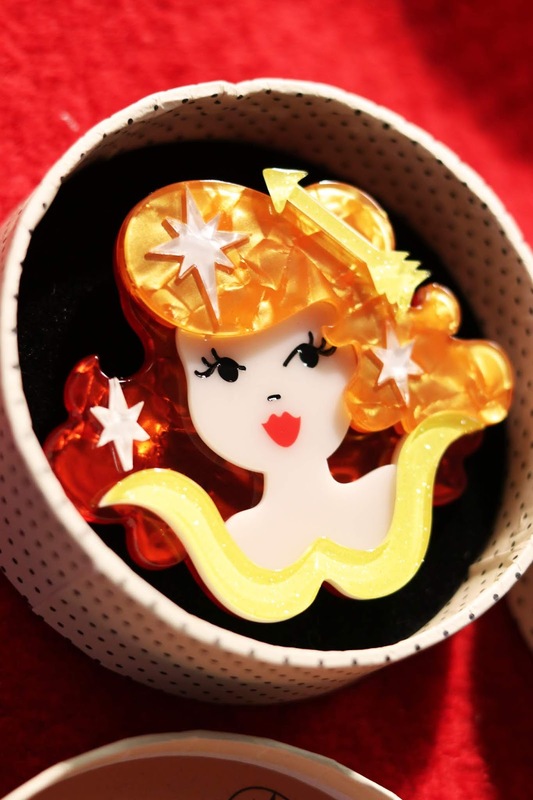 This Erstwilder collection is totally different and absolutely stunning, I must admit that it has tempted me to purchase star signs other than mine and I think a lot of Erstwilder fans feel the same. 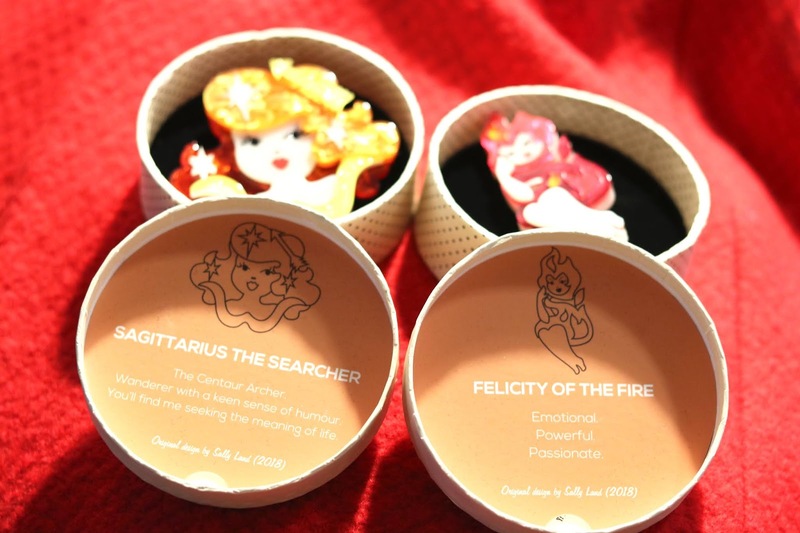 I do think that the Sagittarius has been captured perfectly from her fiery hair and Sagittarius symbols, the colours are absolutely gorgeous too. 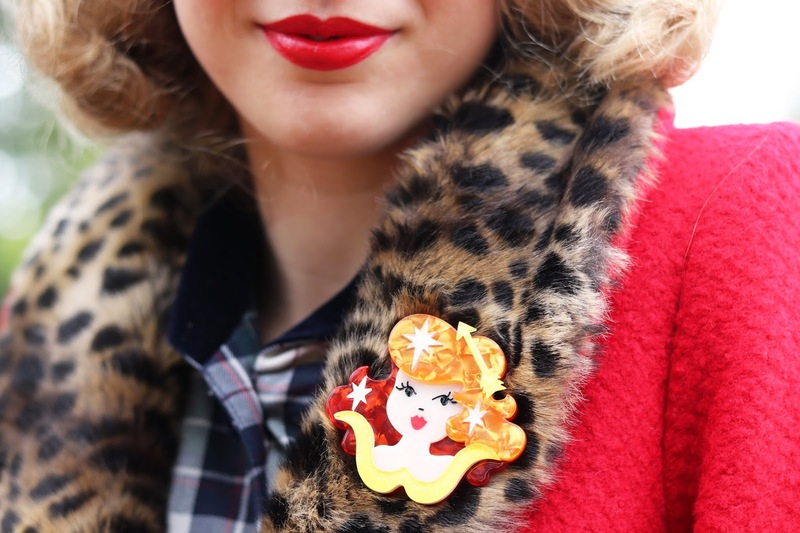 The fire sign brooch is so cute and I think she has a bit of a cheeky look on her face and is still perfectly pin-up. 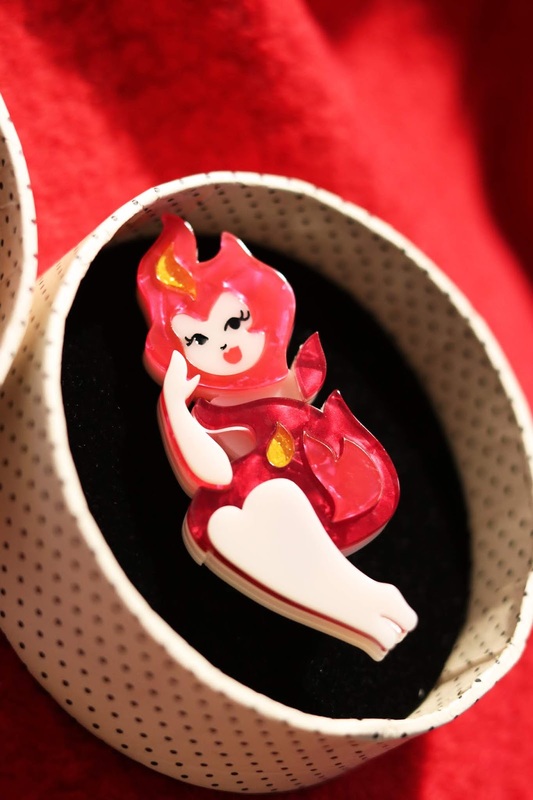 I love the flames and that her body sits in a flame like position to symbolise us fire signs! I have always loved zodiac signs and how different artists represent them so it is a real treat to see Erstwilder's take on this. 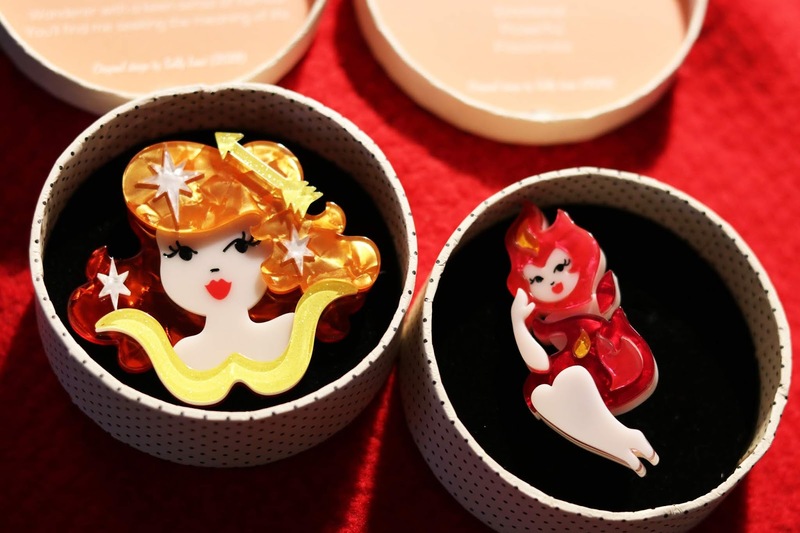 Be sure to check out the full range on the Erstwilder website, they are all so beautiful and a great take on zodiac signs! 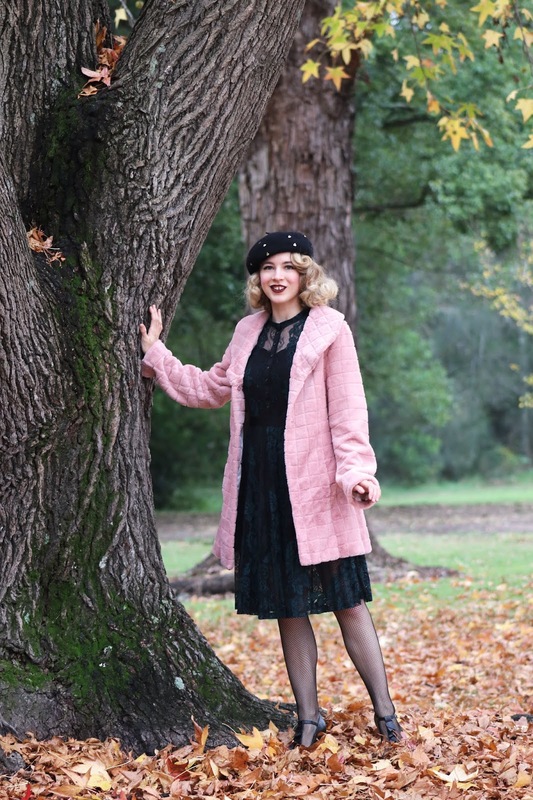 The most dreamy lace dress and a gorgeous fluffy pink coat, what's not to love about this outfit?! It has been pouring rain all day and will keep raining for most of the week, when we were on our way to the park this morning it was still raining but I had my fingers crossed that it would stop for a while, luckily it did stop for about 10 or 15 minutes so we were able to take these photos. 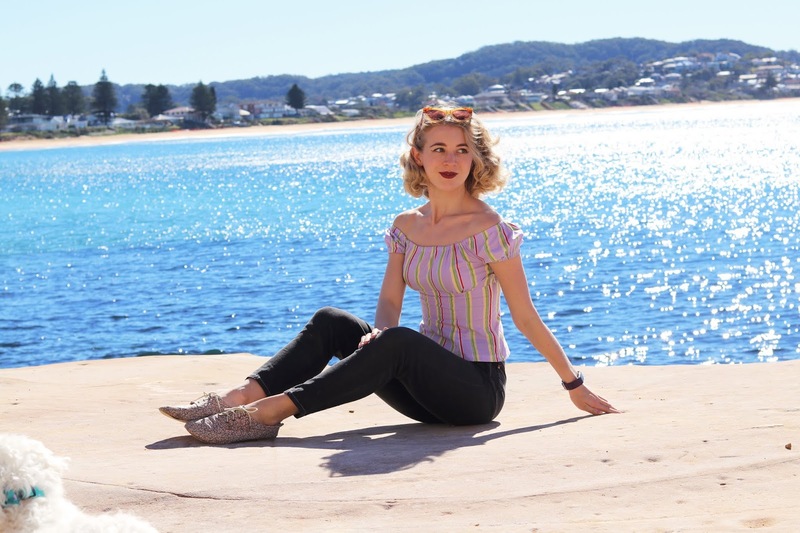 This is my first time trying Aussie label Alannah Hill, I have always admired the brand but feel very thankful to finally have the chance to try some of their designs! 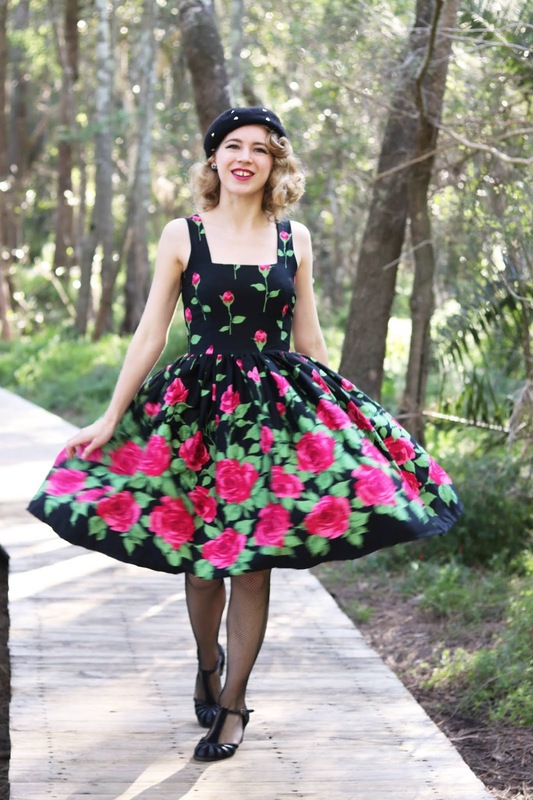 This dress really sets the mood for this cold, dark winter weather and I am so in love with this dress. It's such an elegant design but with the dark tones combined with the lace it gives a more gothic feel and I love to wear an outfit like this that is completely different to my light summer tones. 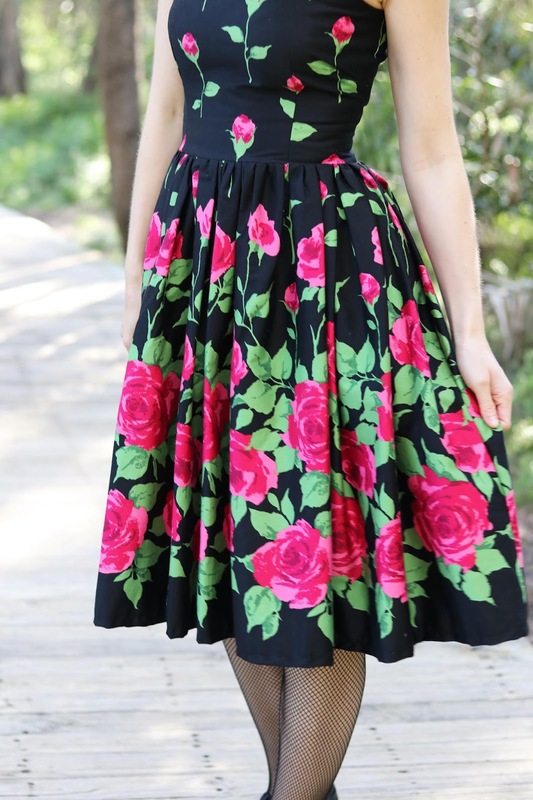 This dress features a separate slip which has adjustable straps, beautiful buttons on the bodice, a pleated skirt and the most gorgeous sleeves. I am wearing size 8, it's a gorgeous but comfortable fit with a little extra room in waist. I think if I were in a size 6 I may have felt a bit restricted in the shoulder area - this is a great fit for me. 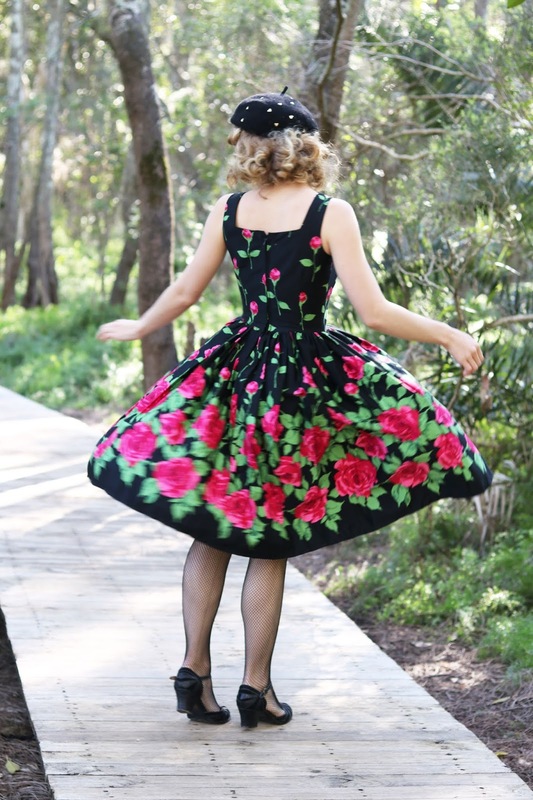 What's not to love about this dress?! I am crazy about it! 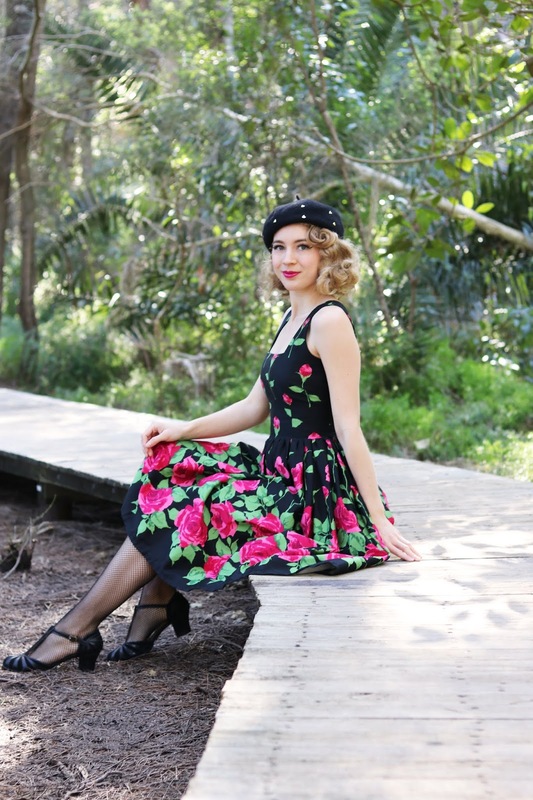 I'm a lover of hats a berets so I could not resist this gorgeous beret with gold heart embellishments. This one holds it shape and sits so nicely, it doesn't fall flat and keeps that nice structured look all on it's own. 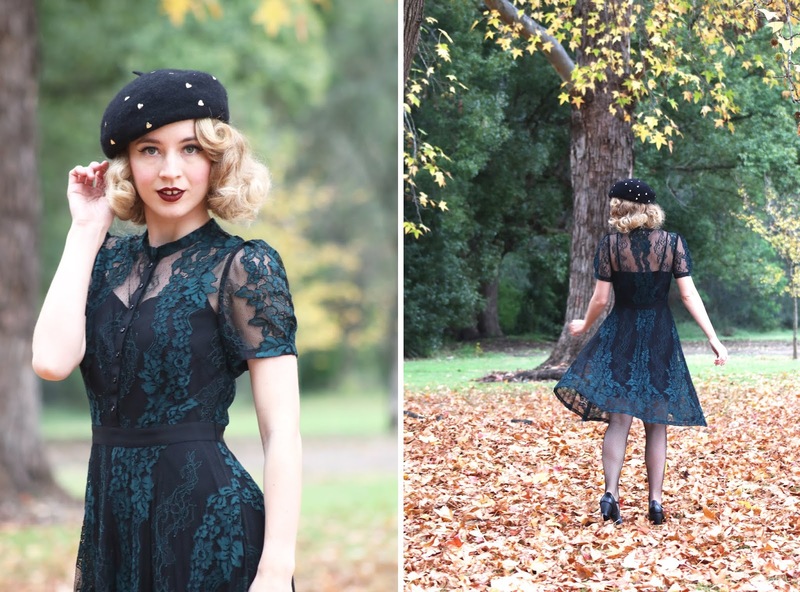 A black beret is a wardrobe staple but add the gold embellishments and Alannah Hill has made something extra special for winter. I chose it specifically to match the dress and I think they are the perfect match, don't you think?! 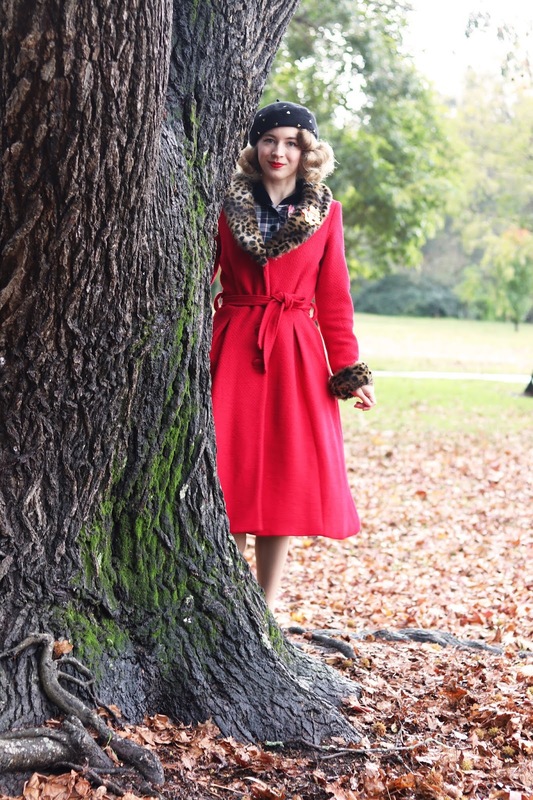 And last but not least, check out this AMAZING faux fur coat! It's pink, it's fluffy, it's warm and it's so beautiful! 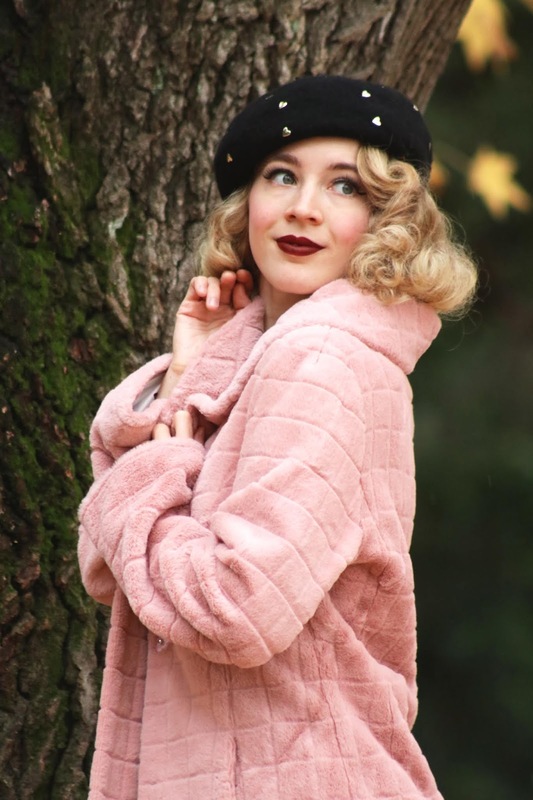 All of my fluffy pink coat dreams have come true. I like the way this pink coat contrasts with such a dark outfit, it really stands out. You will see it on the blog again soon as I have another look in mind for this fluffy coat goodness. I usually always mention in blog posts that I like to size up when it comes to coats so I went for size 10 and I'm glad that I did because it means I still have enough room to layer without that squished up feeling. 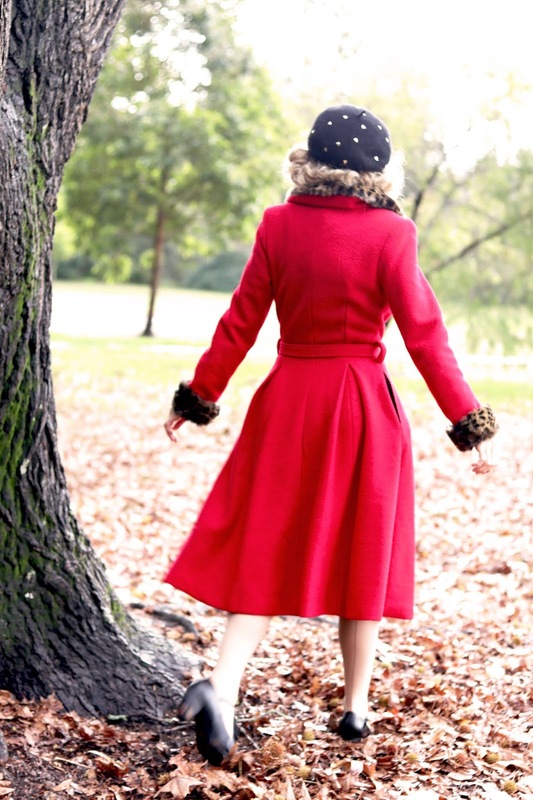 This beautiful coat has lovely lining, a gorgeous structured collar, two dome buttons and really generous pockets. I also love that this is a coat I can dress up and down, it looks great over dresses but will look awesome with jeans too. These pieces have me very impressed and a little obsessed with Alannah Hill now! 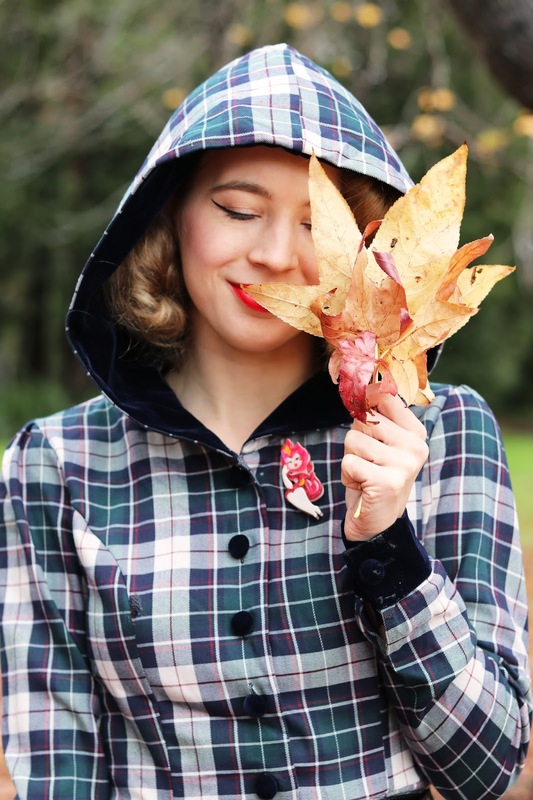 This location at a local park, the outfit and the weather lately is a perfect example of that transition of Autumn to Winter, I'm also enjoying the last of the beautiful Autumn leaves.